All ads must be Digital EPS or Tiff Format or camera ready laser print. Art that does not meet these specifications will not be used and will be returned. All advertising is accepted subject to the approval of the publisher and the publisher reserves the right to reject or cancel any advertisement at any time without penalty to either party. Payment is required in advance for all first-time ads. For subsequent ads, payment is due upon receipt of invoice. A service fee of $25.00 will be applied for accounts not paid within 30 days. Cancellation request must be submitted in writing. Cancellations are not accepted after the advertising deadline date. If space is reserved and artwork does not arrive by press time, advertiser will be billed for space. TLOY 2017 videos are now posted! a policy parade on how to eliminate Americans' rights. To push back on this effort, AAJ Research has created a new online slideshow detailing the top 10 ways the U.S. Chamber hurts Americans. Click here to view the slideshow. "A World Without Lawyers" Video submitted by CAOC - Click Here to view! The Expert Witness Arsenal Packet on Dr. Charles DiRaimando is complete! Click here to purchase! New Pictures Posted! Check out our updated Photo Album! 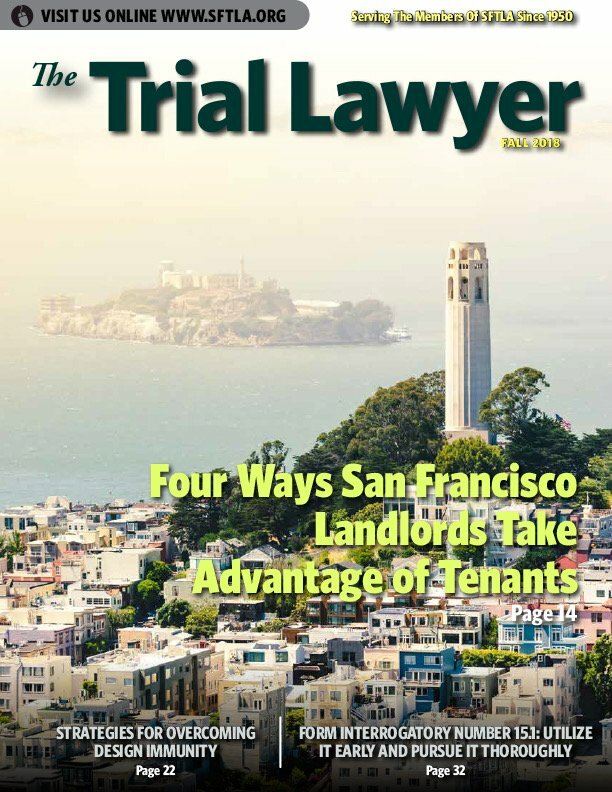 The Trial Lawyer is SFTLA's magazine for attorneys, judges and others in the legal profession.